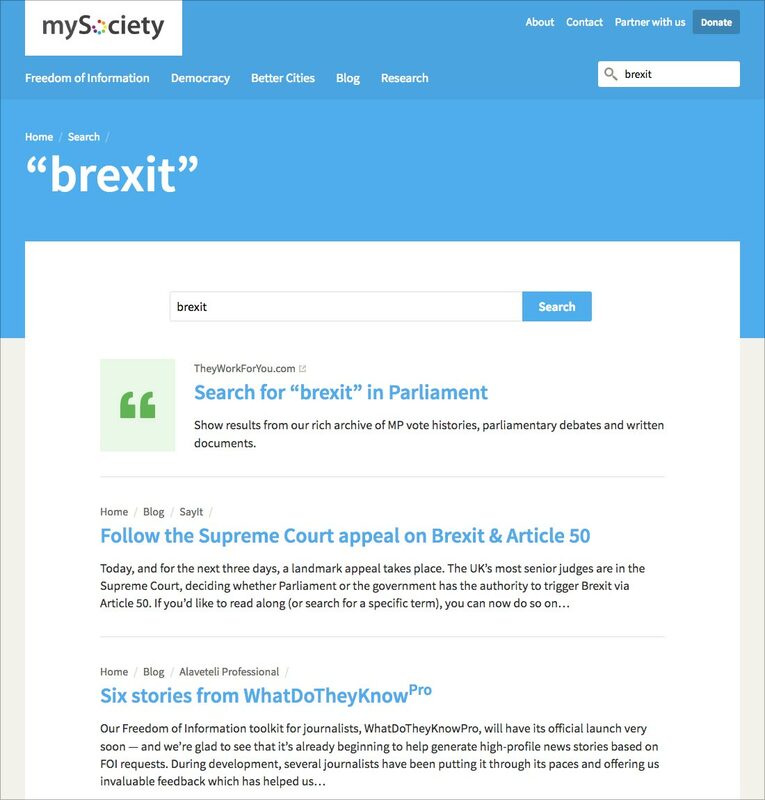 There’s a common theme to a lot of mySociety sites: enter your postcode, see something that relates to you. From FaxYourMP—the mySociety project so old it predates mySociety itself (paradox! )—through to TheyWorkForYou, FixMyStreet, and WriteToThem, as well as a few of our commercial projects like Mapumental and Better Care, we’ve discovered that asking for a visitor’s location is a super effective way of unlocking clear, relevant information for them to act on. 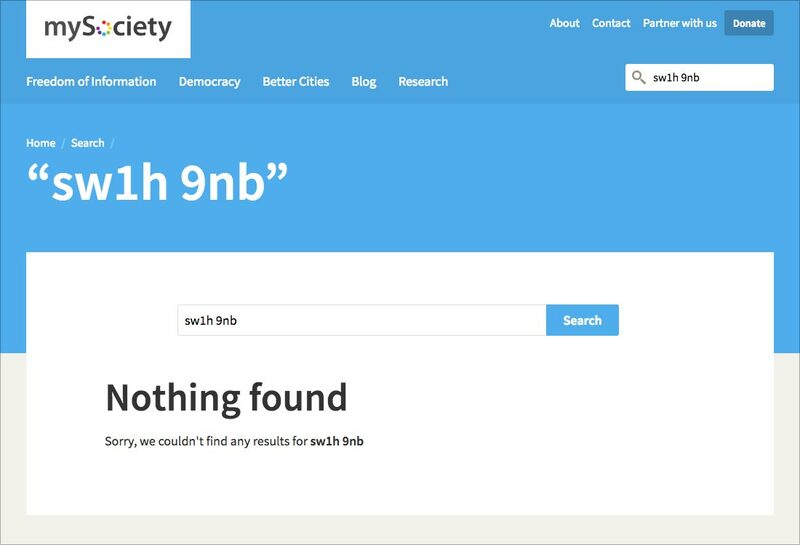 So perhaps it shouldn’t have come as a surprise that, while doing some regular monitoring of traffic on this website, we noticed a fairly significant number of people attempting to search for things like postcodes, MP names, and the topics of recent debates. By default, the search box on this site delivered results from our blog post archive (it goes all the way back to 2004 don’t you know! )… which is pretty much what you’d expect if you know how we do things here at mySociety. We have this centralised website to talk about ourselves as an organisation; then each of our projects such as TheyWorkForYou or FixMyStreet is its own separate site. But, looking at these search terms, it was pretty clear that an awful lot of people don’t know that… and, when you think about it, why should they? The most obvious solution would just have been to direct visitors towards the individual sites, so they could repeat their searches there. Job done. But we figured, why inconvenience you? If you’ve made it this far, we owe it to you to get you the information you need as quickly as possible. Handily, we’ve got rather good at detecting valid postcodes when our users enter them, so programmatically noticing when a user was searching for a location wasn’t hard. And equally handily, TheyWorkForYou offers a powerful API that lets developers exchange a user’s postcode for detailed data about the boundaries and representatives at that location. What do you get when you combine the two? 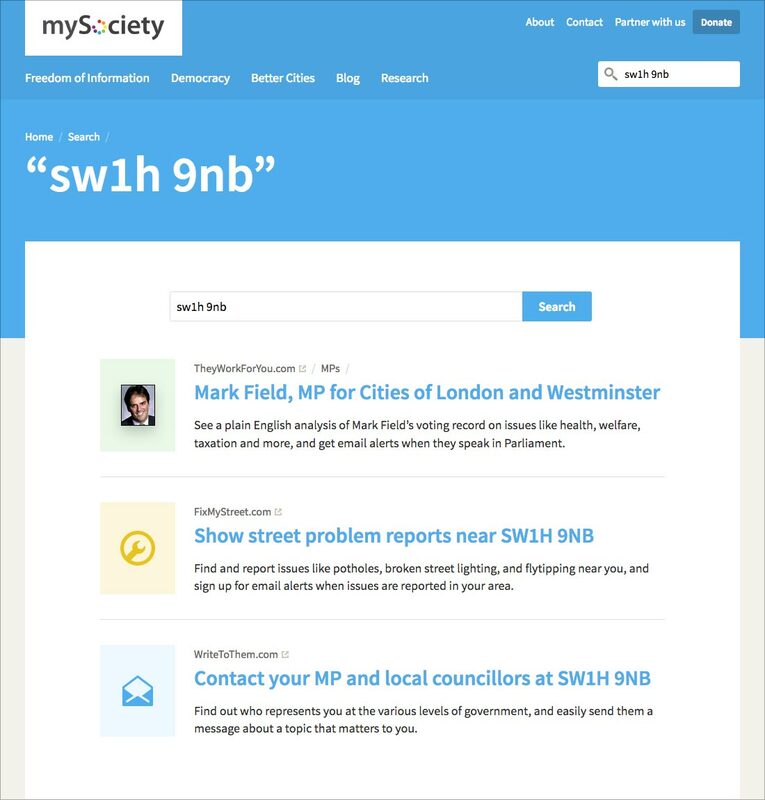 Automatic search suggestions for TheyWorkForYou, FixMyStreet, and WriteToThem, when you enter your postcode on www.mysociety.org. The search page is also aware of the most frequently searched-for MPs on our site, and will offer a direct link to their TheyWorkForYou profile if you search for their names. 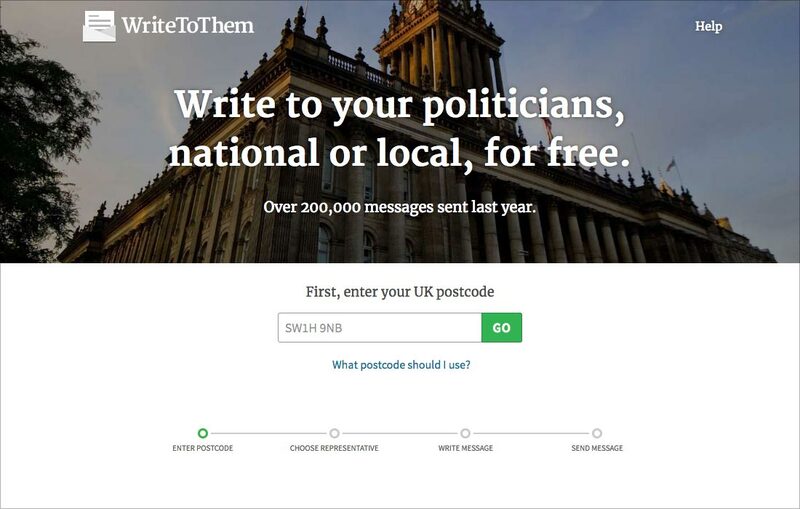 And finally, if you search for something other than a postcode, we give you a single-click way to repeat your search, automatically, on TheyWorkForYou, opening up decades of parliamentary transcripts to you, with a single tap of your finger. It’s not a big, glamorous feature. But it’s something we know will come in useful for the few hundred people who search our site every week—possibly without their ever noticing this little bit of hand-holding as we steer them across to the site they didn’t even know they wanted. And most importantly, it should introduce a few more people to the wealth of data we hold about the decision-makers in their lives. If you’re a teacher, looking to spend the Easter holidays planning lessons, our latest news could save you a little time. mySociety has collaborated with the Citizenship Foundation on the creation of materials for use in schools. These activities, written and tested in consultation with teachers, introduce students to concepts of democracy, citizenship and community. A number of the materials also show students how they can use mySociety websites such as WriteToThem, WhatDoTheyKnow or FixMyStreet to bring about change. We hope that you will find these activities useful. They span years 1 to 13, will fit into a variety of curricula from Politics to Geography, and are completely free to download and use. Access them here – and please do pass the word on to your teacher colleagues.